As a comprehensive engineering and trading company, we offer since the very beinning of 1980 a number of services. These extensive knowledge is also made available as an advisory service to the interested clients. In addition, we provide specific qualified scale-up facilities for numerous high-tech industries of special machine constructions. Furthermore, our professional team is specialized in industrial, municipal and domestic wastewater treatment and drinking water purification. We have made it our priority to meet the individual needs of our international customers by considering simultaneously the different societal values. 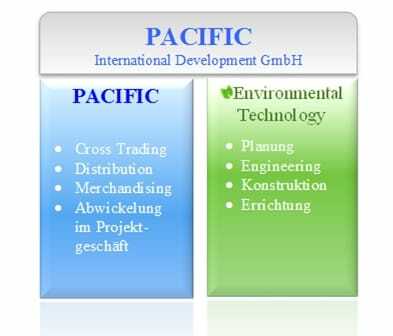 PACIFIC International Development GmbH has gained over the decates substantial experiences in trade and engineering and therefore able to respond quickly and skilfully to economic developments and cultural trends. people’s value with an increase diversification of needs. The reintegration of the European Community (EC), and the movement of the former Communist Block toward the economic market are in process. Such extensive changes in the world and the mutual interdependence of countries on international exchange and trade is expected to become increasingly important in the 21st century. These predicted circumstances calls for a more comprehensive trading company that is able to respond quickly, accurately and flexible to cultural trends and world economic development. Pacific’s assignment is to contribute to society and to serve individual requirements. The competence of the manager to assimilate to permanent changes - throughout the last 40 years - and the will of constant improvement in every area of the company has helped to put Pacific International Development GmbH where it stands now. The management of Pacific is eagerly and highly motivated to contribute to the creation of new values by the exertion that covers the expansion, reorganizing and integration of existing commercial rights and materials. The creation of exclusive markets through new business, cultivating development of excellent products, assertive financial investment, and the acquisition of greater foreign market. 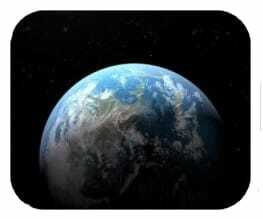 P I D’s assignment is to meet the needs of the world market. To contribute to society and all nations by offering improved functions and services through our associations and extensive power. The dedicated associates of P I D will increase our efforts to meet diversified and specialized needs, to develop business through reliable partnership and to contribute to a more copious international society. The constant wisdom and creative energy of mankind has enhanced the lifestyle of our contemporary world. Presently in the 20th century, the process accelerates with an amazing array of inventions and new technology. To determine the future by observing the trends of the times and using the ratio-logic was certainly the right attitude in archaic times. Today the trends have become more and more dynamic, due to a multimedia-savvy society and the massive increase of information. The trends are losing their structure dramatically. This new era calls for distinctive management with more expansive, innovative thinking. We are confident that the future will not manifest itself; only our own positive endeavours of permanent development can build the future. The ability to build bridges between different cultures in the world, will be a major key that will launch P I D’s customer into the 21st century. P I D has international insight and is working closely in cooperation with local communities, that enable us to act and react appropriately to world wide politics and economics changes. With this qualification and experiences P I D is prepared to step toward the new millennium.